The company Brenntag CR is a leading distributor of chemicals and mixtures in the Czech Republic. Achieving and maintaining this position is not possible without a well-functioning quality management system. Issued certificates confirming that quality management systems are implemented in relevant areas, documented, maintained, and used in accordance with the requirements of the standards. 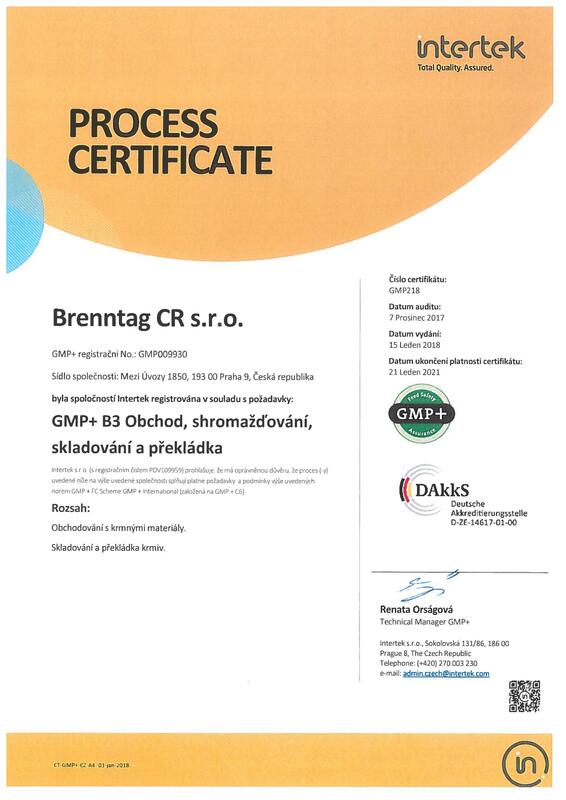 The aim of the certification is to confirm to our customers and business partners that the company Brenntag CR achieves a high level of quality management and control. Our company has successfully passed a detailed audit of all its fields of activity. Certificates prove that processes are strategically very well and managed in the long term with regular evaluation and optimization. During our every day work we do not forget about environmental responsibility. In efforts for safe trade of chemicals, our company strictly complies with all legal regulations and implements internal regulations under strict European norms.Moreover, we participate in international program Responsible care, which aim is to improve safety and limit chemical industry influence on the environment. Brenntag CR participates in this program for a couple of years. SQAS stands for Safety and Quality Assessment System and aims to evaluate the quality, safety, security and environmental performance of Logistics Service Providers and Chemicals Distributors in a uniform manner by single standardised assessments carried out by independent assessors. ESAD II is a module of the Safety and Quality Assessment System, which is addressed to chemical company customers - the chemical distributors. This module provides chemical companies a possibility of objective evaluation of safety and quality management systems within distributor companys that they cooperate with. SQAS for Prague and Chropyně. 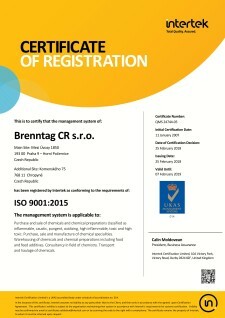 FAMI-QS certificate guarantees highest standards of Brenntag CR feed additives. 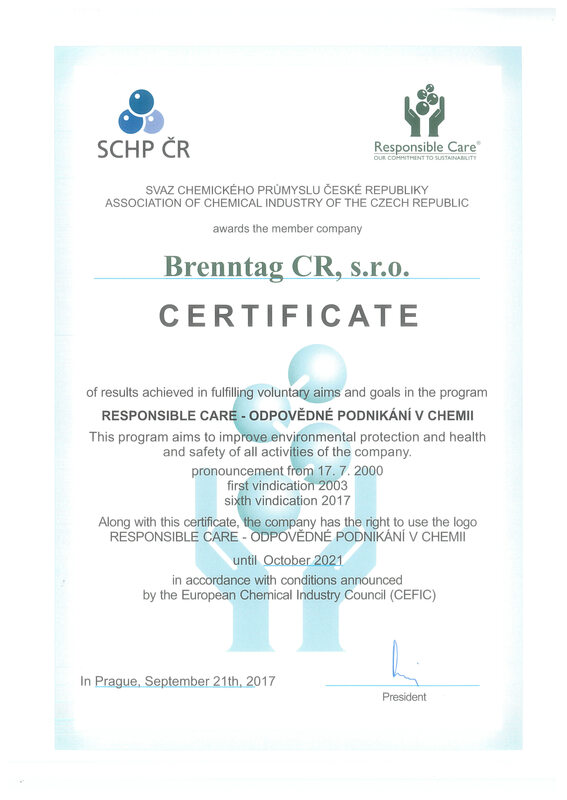 Brenntag CR Ltd. work since 2000 in conformity with the principles of Responsible Care - Responsible Business in Chemistry. Program objectives and their implementation will become part of the management and performance of work at all levels of society and guide the way you work and conduct of all our employees. 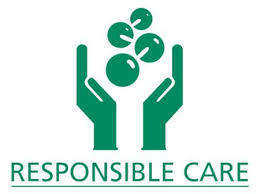 In 2014 we defended the right to use the Responsible Care logo for next season. GMP + is an international standard and set of requirements (including the implementation of HACCP and ISO9001 systems) to ensure feed safety in the market. By certifying we underline the fulfillment and often the extension of all local, EU and transnational legislation in the feed industry. Brenntag CR s.r.o. GMP + certification meets the requirements of the feed market and confirms the high standards of distribution. 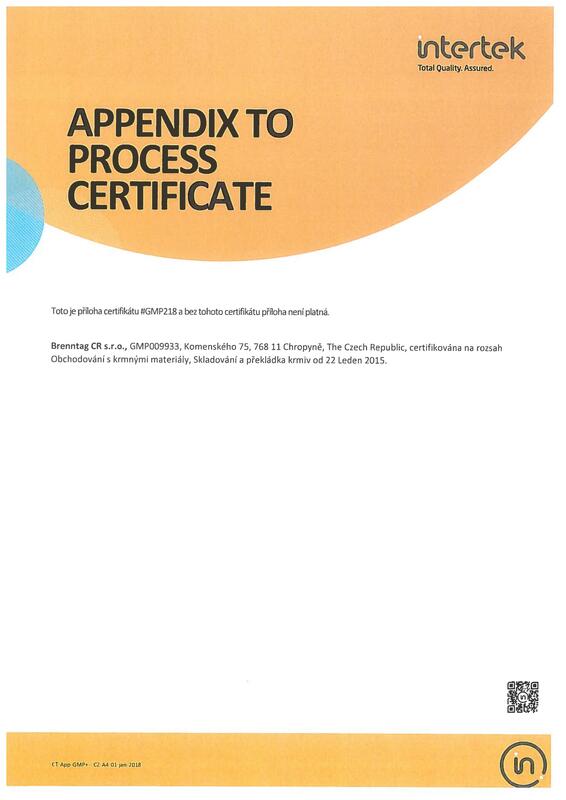 The GMP + certificate is divided separately for Prague and as a supplement to the certificate for our branch in Chropyne. We have obtained certification according to the FSSC standard 22 000. The certification area is valid for the resort in Chropyni for the receipt, bottling and sale of sugar solutions (syrups). Brenntag CR is a leading distributor for the food and pharmaceutical industries. Achieving and maintaining this position is not possible without a well-functioning quality management system. The aim of the certifications is to confirm to our business partners that Brenntag CR achieves a high level of management and quality control. We believe that by gaining FSCC 22,000 certification, we contribute to further enhancing our services and developing future mutual collaboration.